A special report in The Observer on Sunday (April 9) titled ‘Venus – The Hot Spot’, provides a well-written account on a mission called the Venus Express. The Venus express is an European Space Agency (ESA) mission to probe the the atmosphere of Venus and address questions regarding the differences between the climates on Venus and Earth. 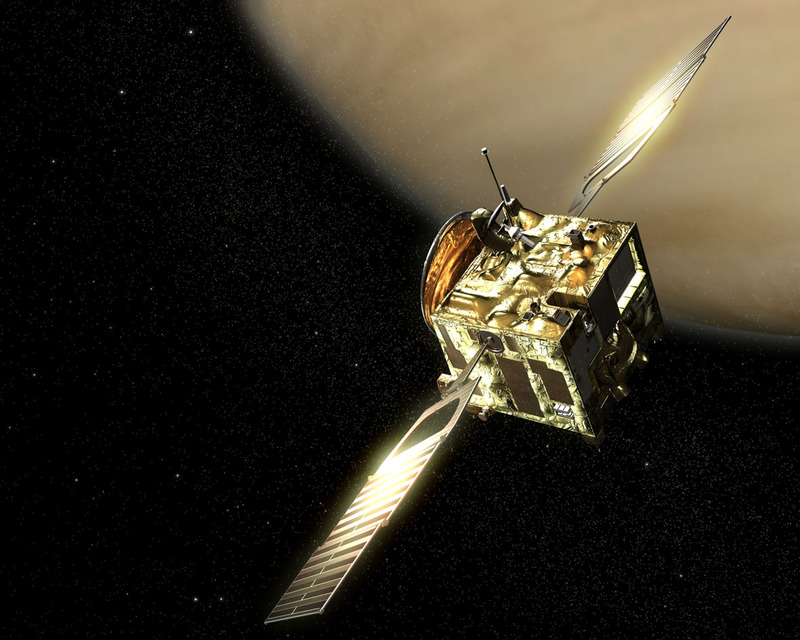 According to the plans, the probe will enter the final orbit around Venus in May 2006, i.e. within about a month. What relevance does a mission to Venus have for a blog like RealClimate? Primarily, Venus offers scientists the chance to see how the same basic physics used to study Earth’s climate operates under a very different set of circumstances. In one sense, Venus is rather similar to Earth: it has nearly the same mass as Earth, and while its orbit is somewhat closer to the Sun, that effect is more than made up for by the sunlight reflected from Venus’ thick cloud cover. Because of the cloud cover, the surface temperature of Venus would be a chilly -42C if were not for the greenhouse effect of its atmosphere. In reality, the surface of Venus, at 740K (467C) is even hotter than the surface of Mercury, which is a (relatively!) pleasant 440K. Per unit of surface area, the atmosphere of Venus has as much mass as about 100 Earth atmospheres, and it is almost pure CO2. This accounts for its very strong greenhouse effect. In contrast, the CO2 in the Earth’s atmosphere accounts for a mere .00056 of the full mass of one Earth atmosphere. Despite the fact that Venus has vastly more CO2 in its atmosphere than Earth, the same basic principles govern the operation of the greenhouse effect for both planets: the fact that air cools by expansion as it rises means that the upper parts of the atmosphere are colder than the surface, while the opacity of greenhouse gases to infrared means that infrared radiation can only escape from the upper portions of the atmosphere. Since the rate of radiation goes down with temperature, the net effect allows the planet to lose energy at a rate much lower than it would if the radiation from the surface escaped directly to space. Although most of the warm surface temperature of Venus is accounted for by its CO2 greenhouse effect, there are suggestions that it is warmer than it should be on the basis of CO2 alone. There are various theories that have been proposed for the source of the additional greenhouse effect, and sorting this out will be one of the major objectives of Venus Express. Another interesting difference between Venus and Earth is that Venus has a very slow rotation rate, taking 243 Earth days to complete one rotation. This is actually somewhat longer than its year. Despite the low rotation rate of the surface, the upper atmosphere is whizzing along at a rate of about one rotation every four Earth days. Pinning down the mechanisms responsible for this super-rotation will teach us much about atmospheric dynamics in general. In particular, it would be interesting to know if there are circumstances in which the Earth’s atmosphere could kick over into super-rotation. Although the atmospheres and climates of Venus and Earth differ very greatly today, it is generally believed that the two planets started out in a rather similar state, but subsequently evolved along divergent paths. Venus succumbed early to a "runaway water vapor greenhouse," in which the increased water vapor content arising from increased temperature reached an end state with much of the ocean evaporated into the atmosphere. Once this happens, it is easy for the water vapor to decompose in the upper atmosphere, whereafter the light hydrogen escapes and oxygen either escapes or reacts with rocks. One hypothesis is that the weak magnetic field at Venus, which otherwise would protect the planet from the solar wind, is one reason for why the oxygen and hydrogen escaped faster into space. Once water is lost, the reaction that turns carbon dioxide into limestone can no longer take place, so CO2 outgassing from volcanoes accumulates in the atmosphere instead of staying bound up in the rocks. The end state of this process is the current atmosphere of Venus, with essentially no water in the atmosphere and essentially the planet’s whole inventory of carbon in the form of atmospheric CO2. Earth, in contrast, kept its water, which allowed the planet to keep most of its carbon inventory safely bound up in the crust. The amount of CO2 in the atmosphere of Venus is approximately the same as the amount of CO2 bound up in the form of carbonate rocks on Earth today. The runaway greenhouse that presumably led to the present Venus is an extreme form of the water vapor feedback that amplifies the effect of CO2 increases on Earth. Is there a risk that anthropogenic global warming could kick the Earth into a runaway greenhouse state? Almost certainly not. For an atmosphere saturated with water vapor, but with no CO2 in it, the threshold absorbed solar radiation for triggering a runaway greenhouse is about 350 Watts/m2 (see Kasting Icarus 74 (1988)). The addition of up to 8 times present CO2 might bring this threshold down to around 325 Watts/m2 , but the fact that the Earth’s atmosphere is substantially undersaturated with respect to water vapor probably brings the threshold back up to the neighborhood of 375 Watts/m2. Allowing for a 20% albedo (considerably less than the actual albedo of Earth), our present absorbed solar radiation is only about 275 Watts/m2, comfortably below the threshold. The Earth may well succumb to a runaway greenhouse as the Sun continues to brighten over the next billion years or so, but the amount of CO2 we could add to the atmosphere by burning all available fossil fuel reserves would not move us significantly closer to the runaway greenhouse threshold. There are plenty of nightmares lurking in anthropogenic global warming, but the runaway greenhouse is not among them. The applicability to Venus of concepts originating in the study of Earth climate is a testament to the beauty and generality of the physical underpinnings of climate science. In turn, testing the resilience of these ideas against radically different climate encountered on other planets and in the distant past of Earth serves a valuable role in helping to shake loose new ideas. We wish the Venus Express team the best of fortune for a successful mission. What effect does the extreme tilt of Venus’s axis, when coupled with the slow rotation, have on its climate? The 92 atmosphere figure is the pressure in bars, not the relative mass of the atmosphere. Venus has lower gravity than Earth. And 0.00038 is the volume fraction of CO2 in Earth’s atmosphere, not the mass fraction. For the mass fraction you want to multiply by the molecular weight of CO2 over the molecular weight of air in general. Venus’ axial tilt is only 2.6 degrees – however it spins retrograde which explains the very high number (177.4) which is published. But what about lessons from Mars? I’ve always wonderd why people say “the atmosphere of Venus has as much mass as about 100 Earth atmospheres, and it is almost pure CO2”. I would say that the atmosphere of Earth has much mass as two Venus atmospheres, and it is almost all liquid H2O, an outer layer of nitrogen and oxygen acounts for only 0.5% of its mass (or some numbers like that). Only by following the convention of not counting most of Earth’s atmosphere, can one say that Venus has more. Of course I follow that convention most of the time as well, but it is still only a convention. The fact that earth cannot have a permanent runaway greenhouse condition like Venus (under present solar conditions), does not mean we can’t have a finite runaway (from human control) GH condition. Currently human emissions are increasing the GH effect, and reduction in those emissions should decrease that GH effect. However, we could (correct me if I’m wrong) reach a point of warming at which reductions in human GHG emission, even to zero, would not stop or reverse the warming process, wreaking great havoc for us & causing mass extinction — which would eventually stop & reverse from natural processes after a long time, as has happened several times in the past. In other words, it’s possible the warming that humans are currently causing could trigger nature to increase that warming in positive feedback fashion, by reduced albedo; releasing ice-stored GHGs; increasing wind-whipped, drought induced fires; killing plants that take in CO2, etc. Thanks for the term, “hysteresis” (#8). I goggled it, and it is applied (for one situation among many) to abrupt CC, due to ocean conveyor halting (and you wouldn’t apply “runaway” to that, even figuratively). But I do prefer “runaway” modified by “finite” or “limited” as a lay term (if not a very scientifically acurate one) for the positive feedback GW situation I mentioned, because it seems more descriptive, than the more general “hysteresis.” Also “runaway” indicates the partial similarity between Venus & Earth — Venus having a runaway GH effect that keeps on going, and Earth, ones that eventually reverse. Anyway, it’s good there’s a scientifically acturate term for what I have been calling “runaway” or the “Venus effect” — aware of the vast, insurmountable differences between the situation on Venus & Earth, but stressing some similarity. Perhaps if people in public had been using “hysteresis” in relation to the positive feedback situation I mentioned, I would have gotten used to that term. But then we would need to distinguish between ocean conveyor halt (involving N. Atlantic cooling) & the positive feedback situation of increasing overall warming. Also I prefer “global warming” to “climate change,” which seems to imply that climate always changes one way or the other, no big deal (esp since most people confuse climate with weather). Even “global warming” sounds much more benign that it is in actuality. On Earth, the relationship between the concentration of carbon dioxide and its greenhouse effect is logartihmic – each doubling causes the same increase in radiative forcing. I understand that is not the case where the atmosphere is extremely dense, as on Venus, because carbon dioxide absorption bands expand with increased atmospheric pressure (collisional broadening) and higher temperatures (doppler broadening). My question is does this happen because the atmosphere is mostly carbon dioxide, or would a smaller amount of carbon dioxide have a larger effect than on Earth if the atmosphere on Venus had the same mass but was mostly (say) nitrogen? In other words is it the density of carbon dioxide, or simply atmospheric pressure? I would be very interested to know what areas of climate science are in need of research funds. Please dont reply : “all”. I have seen references to cloud effects (post 8) before by you all and recall someone commenting that it would be useful to have a few satellites up to measure whatever it is that needs measuring – in this case I guess ; creation, movements, disappearance, density, altitude and reflectivity. Obviously without measuring something you are stuck, and you need the right tools to measure accurately. This doesnt just apply to clouds, but also surface and water temperatures, ocean circulation and the rest. One of my sons in law works on undersea surveying for bigoil and the telecomm companies : he has given me tuition on ocean temperature measurement so I know a little of what one needs to get “good” readings and it doesnt come “cheap”. So just approximately, give or take a few hundred millions of Euros (or $ or Â£ if you prefer), indulge me a little please and tell me as a best ballpark guess (you understand the qualifications I am sure) what you most need to measure, how you need to do it and why? Perhaps a general post on this very subject for all would be terrific. In my view it is the right time to discuss it. My guess is that the brainpower for analysing the data and thinking about it, are on the net and dont require university chairs (I may be wrong). PS The AGW argument is now effectively won but as I said on another post : “Never let a challenge go unanswered”. We need to move on to more positive areas like understanding better and fixing it if we can. And I am sure we can fix it. I haven’t seen that paper, but I’d like to. The previous major paper I remember on the Venus rotation was Dones and Tremaine (1993), which proposed that a large, late planetesimal hit Venus going the wrong way. I don’t know offhand what empirical test you could make to distinguish between the two. * Global observing system suitable for climate trends. Much of weather observations are made primarily from the viewpoint of feeding into NWP models for short-range weather forecasts, leaving climate scientists with a fiddly job of trying to construct trends. It can sometimes be hard for systems to have long-term funding: e.g. the UK contribution to the ARGO system of ocean buoys is currently funded as part of a temporary “demonstration project”, but no-one seems willing to committ to funding it for the long term [~decades]. * Digitisation. There are a lot of old records [eg Navy ship log books] that would be extremely valuable were they digitised. At the moment this is done in a very ad-hoc manner, with the scientists involved roping in their wives, etc, on a voluntary basis, to help with the process. This would be beneficial for looking at decadal variability of climate, which would help with climate model validation. * Although there are many other uncertainties that need addressing in climate science, such as cloud feedback or aerosol forcing, it is much less obvious that large increases in funding will increase the rate of progress of research in these areas. * I imagine that bigger and faster supercomputers will always come in handy, though. The Correia and Laskar paper is in Nature with fuller descriptions in Icarus. The problem with the giant oblique impactor is that you need to drive off most of the radiogenic argon while leaving the primordial argon and CO2, and somehow avoid creating moons, and have it hit such that you are left with a very small (absolute) obliquity. Re: #7 An interesting wrinkle with the definition of Venus’ atmosphere is that in the lower few kilometers CO2 is no longer a true gas but a supercritical fluid – an issue, that, so far as I can tell, has not been fully explored. What is a suprcritical liquid? Beyond what is known as the critical point on a pressure-temperature graph, there is no clear distinction betwen gas and liquid – for example, a supercritical fluid can act as a solvent, yet lacks surface tension. This makes supercritical CO2 ideal for, example, decaffeinating coffee. It is also something that needs to be dealt with in CO2 geological sequesteriation schemes. CO2 goes supercritical at 73 bar and 31 degrees C.
Thanks Duncan Young and Raypierre. I’m wondering if Venus might have had life on it at one time, or is the rotation too slow (those nights must be killers, as well as those days). Could any of the CO2 in its atmosphere have been from organic sources? Forgive me playing devilâ��s advocate here but I would think that a denialist/skeptic would have grounds for complaint about your discussion of the dynamics of Venus vis-Ã -vis life on Planet Earth. You say: *the upper atmosphere is whizzing along at a rate of about one rotation every four Earth days. Pinning down the mechanisms responsible for this super-rotation will teach us much about atmospheric dynamics in general. * Surely a skeptic as to the worth of current climate models would counter: *here is a simple system where they donâ��t have to worry about the problems of water vapour, patchy cloud cover,oceans, methane, aerosols, etc. If their models are so good, surely they should be able to plug Venutian values into their models and at least demonstrate rotation, if not a correctly quantified super-rotation*. Sorry if such an argument is off the planet but I am still a bit mystified as to exactly how climate models work despite having an initial read of prior postings on models. Some of the old Viking colonies are under 6 ft of ice. The polar bears will just have to adjust if temperatures there return to “normal”. BTW there has been evidence of global warming on Mars thought to be due to increased solar output. Yet during the same time frame (the last 6 to 10 years) the Earth temperatures have either not changed or have gone down slightly. So we have increased solar output, increase CO2 and yet temperatures have stalled. No model has predicted this. Me? I worry about the coming ice age. Plants do not grow well under ice. I propose mirrors in space. Re #10 – Thank you, RayPierre. You answered my question at just the right level of detail. I am not ready yet for the differential equations of your chapter four, but maybe someday. …a quick reality check shows that Greenland’s ice cap is hundreds of thousands of years old and covers 95% of that island, so just how different could it have been only 1000 years ago? Greenland was called Greenland by Erik the Red (was he red??) who was in exile and wanted to attract people to a new colony. He believed that you should give a land a good name so that people want to go there! It very likely was a bit warmer when he landed for the first time than it was when the last settlers starved due to a number of factors, climate change a likely major one…. BTW there has been evidence of global warming on Mars thought to be due to increased solar output. Warming on another planet would be an interesting coincidence but it does not necessarily have to have the same cause. The only relevant factor the Earth and Mars share is the sun, so if the warming were real and related it would have to be due to the sun. The sun is being watched and measured very carefully back here on earth and it is not the primary cause of the current climate change. Yet during the same time frame (the last 6 to 10 years) the Earth temperatures have either not changed or have gone down slightly. So we have increased solar output, increase CO2 and yet temperatures have stalled. No model has predicted this. First, as an addendum to the issue of solar mechanisms, since direct solar forcing doesn’t work, some scientists have tried to propose more exotic solar mechanisms such as the sun’s affect on intergalactic cosmic rays and their affect on clouds. However, besides the fact that the trend in the cosmic rays doesn’t seem to fit the observed warming, the problem with such mechanisms is they rely on specific aspect of the earth’s atmosphere that seem like they would be unlikely to hold in Mars’s much different and thinner atmosphere. Thus, an observed correlation between warming on Earth and Mars probably could not be explained by them. Second, in claiming that warming has not been observed recently, I assume that you are probably referring to Bob Carter’s recent piece ( http://www.telegraph.co.uk/opinion/main.jhtml?xml=/opinion/2006/04/09/do0907.xml ) that has been wildly touted in certain circles. However, Carter’s claim is laughable once you look at the actual graph that he makes the claim from: http://www.cru.uea.ac.uk/cru/info/warming/ It is clear that the general trend is still up…and while it is true that the warmest year is still 1998 according to this CRU / UK MET data (although NASA data shows 2005 just barely beating out 1998 for the record), it is one clear outlier and the last 4 years occupy the 2nd – 5th positions amongst the hottest years in the instrumental record. His claim is basically akin to me denying the existence of seasonal cycles because it was colder here in Rochester last Saturday than it was in most of January! I think I’m going to go with “Venus effect” for the positive feedback GW situation that may happen here on Earth under present trends (& has happened in the past during some of our mass extinctions). It’s short & catchy, and gives some information (assuming people know Venus is a planet, and that it’s closer to the sun, etc. ), or at least a basis for curiosity, discussion, and argument about in what ways Earth’s situation is like that on Venus, and in what ways is it different. And I do think we need a quantum leap in arguments here from whether or not GW is happening, to whether or not a Venus effect will be starting (or perhaps has started). And I figure the term is no worse a metaphor than “greenhouse effect” – people don’t really think there is a glass enclosure surrounding Earth or Venus. (Greenhouses are also called “hothouses,” and perhaps we should have used the term “hothouse effect” since it is more acturate and “green” has lovely connotations of plants & grass.) And people are smart enough to understand that Earth is not Venus, only a bit like it. Then maybe we can use “hysteresis” for the reversal part of the Venus effect (getting back to habitability), as in “Now [it would be thousands of years from now if we are indeed headed toward a Venus effect] we’re in the hysteresis phase of the Venus effect” (assuming there are people with culture still persisting). So there’s the runaway phase and hysteresis phase of the Venus effect (I hope I’m not totally killing off the scientists here with fits of incredulous laughter. A couple of questions: First, would a runaway H2O/CO2 greenhouse on Venus heat the atmosphere enough for H2O to escape as a molecule? If so, that ought to give you a maximum possible temperature. Secondly, to what extent does water dissociation play a part in the oxidation state of the Earth’s surface? I know that I’ve been told that photosynthetic critters are responsible for the early Proterozoic oxidation, but it seems to me that you need to sequester a tonne of organic carbon for every 12.5 tonnes of ferrous iron that goes ferric. There’s a whole lot of early Proterozoic ferric iron lying around- shales, BIF’s, and terriginous sediments in addition to the economic deposits- but I’ve never heard of anyone finding contemporaneous carbon deposits. And that doesn’t even start to take into account the sulfates, manganese, and free O2 in the atmosphere today. Got any good references on this topic? “Venus is dead” By this a geologist meant that the radar mapping of the surface of Venus shows no signs of plate tectonics. Persumably a radar mapping of Terra and Mars at the same resolution would. I have some difficulty with the thought that there are no convention cells in the interior of Venus. So is it the surface conditions and atmosphere that somehow mask the surficial results of magma circulation? Is the actual composition of Venus that much different from Terra? Raypierre, thanks for taking the time with your modestly labeled ‘dabbler’ reply. Clearly the geologist’s remarks I read were mistaken. For the record, I should have said that “Mars was, in the past, tectonically active.” There are big extinct volcanos, for example. Your website is extremely informative and useful in helping us understand the direction and implications of increasing levels of CO2 in the atmosphere. It may be helpful, at least as a sidebar, to understand part of the picture of what it means, from a technology perspective, to actually limit CO2 emissions for the electric industry. For that, I direct you to a recent presentation from Steve Specker, President of the U.S. based Electric Power Research Institute (EPRI). His presentation describes the technology options, the cost implications, and the technology advances necessary to limit CO2 levels to 550 parts per million. What’s to be gained from the study of the Venusian climate, surely its difference from Earth lies in the slow rotation speed. A comparison of the two is like apples and bananas? RE: comments 20 & 24 & Greenland. I just read Jared Diamond’s book _Collapse_ which devotes a chapter to the Norse Greenland colony. According to Jared, the Norse settled in what were then & are now 2 of the greenest & most pleasant parts of the island. The settlements didn’t get overrun by glaciers, but the norse agriculture was marginal enough there that a slight temperature decrease was enough that a several cooler summers in a row were enough to cause starvation, especially when combined with more sea ice preventing trade with Europe.